WAFFLES: BOSS! I have Glogirly's subscription ready! KATIE: Prescription, Waffles. Not subscription. She doesn't need a People Magazine, she needs apple juice and cold medicine. WAFFLES: And a ginger cat. Definitely a ginger cat. Between 15 sleeps away from us, working elebenty hundred hours in just a couple of weeks and a date with her oral surgeon, Glogirly has managed to catch the mother of all colds. We're working hard to make sure she adheres to the 12 catnaps a day rule. We hope to be back to our silly funny selves in time for Waffles Wednesday. WAFFLES: But can't I be silly funny on Monday too??? Feel better soon, Glogirly! I'm sure your kitties will take good care of you. You can be silly funny anytime you want, Waffles. Poor Glogirly. She's really having a time of it. Tell her that all of us on the Farm are thinking of her. We send virtual hugs and soup. Oh dear! We are sending lots of healing purrs from Oklahoma. Hope Glogirly is feeling right as rain ASAP! Oh goodness! That is awful. So glad you two are being good nurses. Feel better Glogirly. Poor Glogirly! You kitties are just going to have to work overtime to help her get better. Get some rest Glogirly. I hope you feel better quickly. Hanging around with all of those out-of-town cold germs did her in, did it? You two are just the pawesome nurses to take great care of her and get her feeling better again soon. Poor Glogirly! 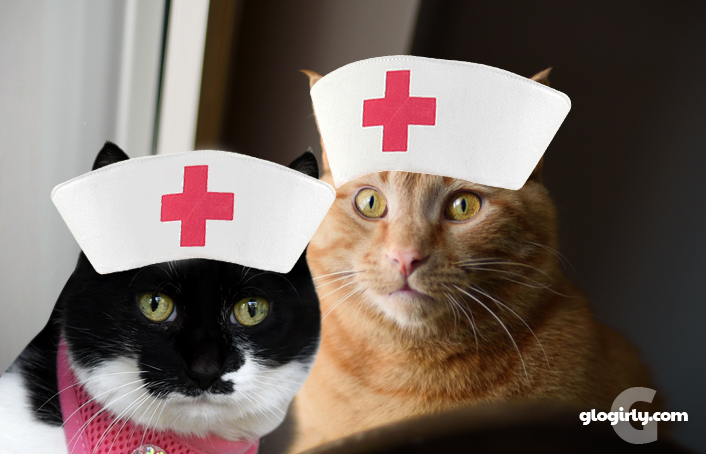 We send healing thoughts and purrs! Get better soon. Try and have a good week. Oh, Glogirly, we are so sorry you are so sick! It has been a very rough month for you! But we know you have excellent nurses and Gloman there to take real good care of. Get well soon! Take good care of her. She sure needs those elebenty naps a day for a while. Wow, you made her post even when she was sick?? Go make her some biscuits with a heapin' helpin' of purrs. Poor Glogirly! I hope she soon feels better. Purrs for a quick recovery! Sending healing purrs. Your poor mum, all tired out her immune system went wonky. At least now she is at home getting proper kittie care. Oh no!! A big indicator Glogirly worked too hard and was away too long from home sweet home! Thank goodness she has the best nurses in the townhouse! Rest well Glogirly. Get Well Soon Glogirly. Such cute nurses you have. Y'all look adowable. Weez sendin' purrayers. 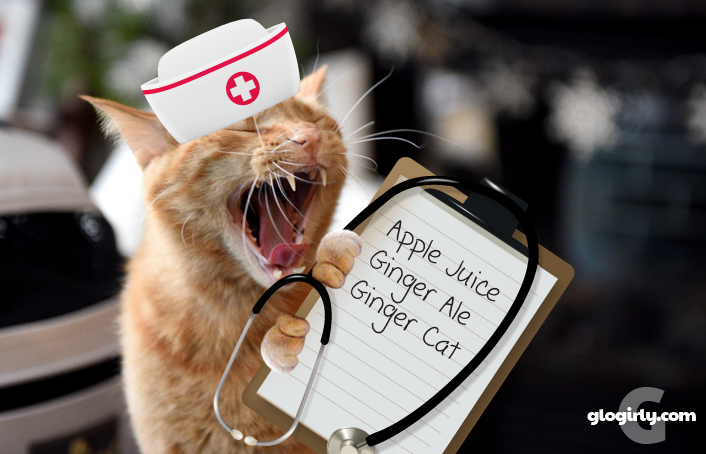 Get Well Soon Debbie...and be careful of what Nurse Waffles gives you...lol..
OMC! Don’t tell me she got a cold on toy of the surgery. Sending mega healing purrz. Too bad she couldn’t wait till she rested before the surgery. Oh no! We hope she feels better very soon. Definitely too much going on there! I know you two will take excellent care of her.